While not all of these courses are strictly within GUE’s Technical Diver curriculum, here is training that will help you advance your diving. The GUE Doubles Primer introduces certified divers to diving a double (twin) tank configuration. Learn about the components of a double tank system, why and how to configure the system, and how to operate and dive with doubles. Refine buoyancy, trim, stability, control, propulsion, maneuvering, pre-dive checks, team diving, and situational awareness. This is an optional, workshop-style class. Enjoy the full recreational depth range using the right gases and procedures for ultimate dive enjoyment. GUE’s version of deep diver. Rec 3 introduces divers to the basics of double tank manifold failures troubleshooting, and how to plan and conduct dives on nitrox or helium mixtures to a max of 130ft (40m) with a limited decompression obligation, including a switch to a staged decompression gas. Have a clear head at depth and be able to stay down long enough to thoroughly enjoy the entire recreational depth range. Excellent penultimate class for the recreational diver or an optional incremental step for those with aspirations of deeper diving. This class is aimed at students un-interested in diving deeper than 130 ft (40m). Explore deeper or longer with the right gases and procedures that allow you to see those wrecks, reefs, or fish not seen within the limits of recreational diving. Develop the knowledge and skills to utilize decompression gasses, helium, determine ascent profiles and manage failures. Wet Rocks Diving offers Tech 1 instruction. GUE offers both semi-closed rebreather (PSCR via RB80) and closed-circuit rebreather training (JJ-CCR). As a GUE Cave 2, Tech 2+, JJ-CCR diver, Mer is familiar with these classes. Email her today to discover if any of these offerings are right for you! Mer will recommend the right pre-requisite courses to complete your skill-set preparation for these upper-level classes and recommend instructors for your additional GUE training. 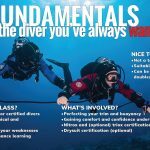 Wet Rocks Diving offers coaching and workshops, focusing on refining your Fundamentals skills and ascent precision to help you make the most from your Tech class.